You can use this link to access your personal Virtual Career Coach site at any time. Do let your consultant know if you have any queries. If you are in doubt about navigation, please speak to your consultant in the first instance or to one of our online consultants. If you have other requests or ideas, please let us know.  The “Your Virtual Career Coach” gives you Unlimited 24/7 access to your personal career resource. WHAT IS VIRTUAL CAREER COACH? Virtual Career Coach is a suite of engaging, multi-media, online resources for you to access which are intended to support you during your career transition – It provides you with the practical help, support and guidance needed to secure a new role. 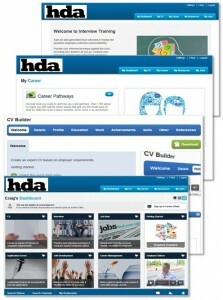 CV Builder Simulator: CV planning, writing, checking. Interview Simulator: Take an auto-generated mock interview. Practise your interview technique. 1,500 Employer Videos: covering CV, interviews, assessment centres, job hunting, pay negotiation, In work (1st 3 months), using recruiters and much more. Career Assessments & Job Tests: Practice for the real thing. Career Pathways & Careers Matching: help you discover what you could do. Company Research / Job Search E-Learning: Discover companies in a specific sector; find people who work at specific companies. Career Action Planner: Set goals, keep track, plan and measure your progress. Newsroom & Weekly Career Newsletter: latest news and newsletter straight to your in-box. 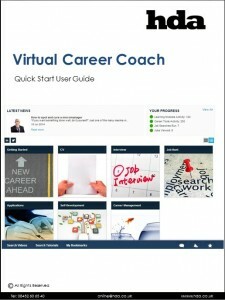 See your downloadable summary here: Virtual Career Coach Overview. Online consultants can help you use the candidate website and other HDA resources to achieve your career transition goals.